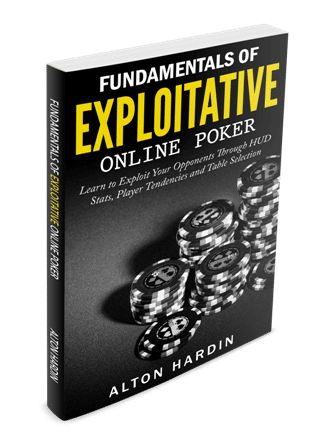 Below is an excerpt from my Fundamentals of Exploitative Online Poker eBook on Amazon.com. In this chapter we will talk about some specific exploitative poker strategies that you can employ at the poker table to exploit bad poker players’ tendencies. Remember that a majority of the bad players we will be playing against will be loose passive opponents that love to limp pre-flop. If you site, table, and seat select well (this topic is covered later in the book), then you should have no problem identifying and sitting with a lot of bad loose passive players. The strategy for exploiting open-limping pre-flop with a very wide range of cards is to isolation raise the limper(s). You should isolation raise your standard opening range for the position you are sitting in and if the limper(s) are limping a super wide range then you can even consider opening up your isolation raising range even further if you are in position. Why when you’re in position? You want to utilize your positional advantage against bad players. My recommendation is to raise 3bb plus 1bb per limper. If you find that too many people are calling your isolation raise, then bump it up a bit to 3bb plus 2-3bb per limper. Why? Your goal is to claim your isolation against the loose passive limper(s). Ideally you do not want more than 2 callers because if too many people call your post-flop equity decreases drastically. Hand Action: UTG open limps for $0.10 and it folds around to hero in the CO. Hero isolation raises to $0.50 with A♦ T♣ , the blinds fold and UTG calls. The flop comes K♣ 9♠ 4♥ , UTG checks and hero bets $0.70 and UTG folds. Hand Analysis: Hero raises pre-flop to isolation raise a loose passive bad player who is limping an insanely wide range of cards with VPIP stats of 67%. Post-flop, hero can easily semi-bluff c-bet on such a dry board texture a high percentage of the time and win right pot right then and there. Why? Villain will miss the flop a high percentage of the time limping so often pre-flop and will respect hero’s c-bet when hero represents a pair of kings. Visit Amazon.com to Purchase this eBook Today!